Not something I normally get excited about, but then I don’t often go shopping for shoes. Or clothes for that matter. But we’re starting to think about all the things we will need for our cruise in the summer, and on my long list of stuff I found shoes. And sandals. And trainers. Oops! So we trudged around town and the outlet village yesterday, and I found a lovely new pair of Converse (I do love Cons) in a funky purple colour, then a bargain3-for-2 on all women’s shoes in Clark’s at the outlet village. And by some miracle I actually found 5 pairs I liked! I’m really fussy about shoes, have my own peculiar taste and will not compromise. Luckily 2 of the 5 didn’t fit so well, so I didn’t have to make any really difficult decisions. The red shoes are almost identical to my previous pair of favourite shoes…only leather instead of suede. I even bought sparkly silver laces for the Converse. Anyway, in other news…again, a week with very little knitting. I have made a little progress on the trainer socks I’ve been knitting on train journeys, but that’s it really. I’m pleased with it, and I hope Avril will be too. Now I just have to track her down and hand it over. 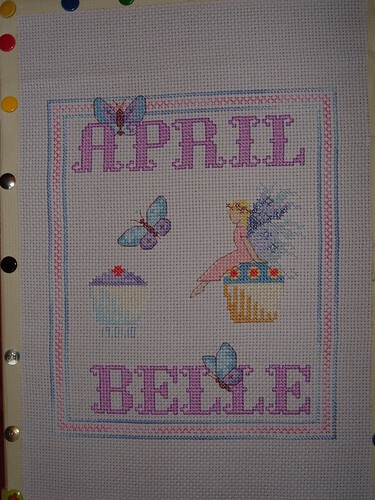 Next I’m going to start another cross-stitch picture, this time for my brother’s baby, which is due in June. I’m going to make an Elmer picture, which A’s Aunt is planning to incorporate into a patchwork cushion for Baby’s room. In work news it was another weird week, with lots more IT issues. I even ended up working at home on Weds with no laptop! Not much work got done. I didn’t get out to meet Caron for lunch, as planned, as she was unwell. I could have gone to Knitting in the Library instead, but I had the crisp craving and decided it was best to stay away from shops (the library is next door to an enormous supermarket) altogether. This coming week…hopefully a straightforward one. I have an appointment with the dietician, to discuss my progress on the intolerance diet. I’m sorry to say, I don’t think the pain is a food thing…I really think it’s more about exercise and activity. Still, I’m persevering with the diet, and this week get cheese (today/tomorrow) then chocolate. Mmmmmm…chocolate. It’s easier now I can have stuff like pasta and bread, and some dairy, but I still miss the treats. 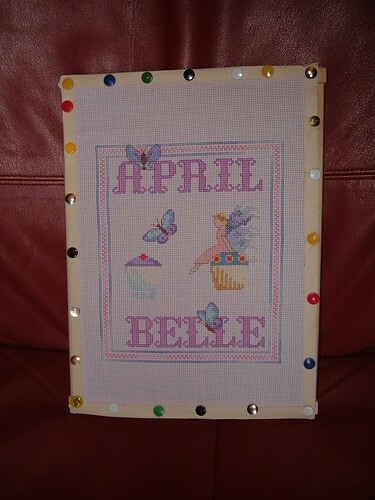 This entry was posted on April 10, 2010 at 11:41 am and is filed under Baby, Cross-Stitch, Food, Holiday. You can follow any responses to this entry through the RSS 2.0 feed. You can leave a response, or trackback from your own site. LOVE the red and purple shoes, I might have to hit the outlet village when I get paid!